An entirely new line of equipment for Wacker Neuson in North America, a five-model compact excavator family includes two “true” zero-tail-swing models. With the 3.5-metric-ton 38Z3 and5-metric-ton 50Z3, the tail stays entirely within the tracks during swing. The line's largest model — the 8-metric-ton 8003 — combines 69.5 horsepower, high-output hydraulics, and a maximum digging depth of 14 feet 1 inch in a short-tail-swing configuration. Yanmar three- or four-cylinder engines power all Wacker Neuson excavators. Product-line features: Each of the five Wacker Neuson excavators features boom-mounted working lights, rubber tracks, a dozer blade and control pattern selection system. A full line of attachments is available for all models. 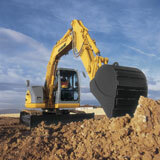 Three D-Series excavators joined the Caterpillar compact or mini lineup in the spring of this year. The 307D and compact-radius 308D CR models are replacements for C-Series models, while the all-new 308D CR SB combines the compact-radius design with a swing boom for even more versatility. The D-Series excavators outperform their predecessors with 22-percent higher bucket forces and 10-percent higher stick forces, says Caterpillar. Lift capacity has been increased with the addition of a larger counterweight, and a reported 15-percent gain in traction forces improves dozing and turning performance. Product-line features: Each of the three new D-Series compacts is powered by a new turbocharged Mitsubishi 4M40 TL engine, rated at 54 net horsepower. The 308D CR and 308D CR SB are among six compact-radius excavators ranging in size from about 7,500 to 18,500 pounds, providing tight-work-area options for various applications. All seven of the Case excavators under 11 metric tons have been reintroduced this year with Tier-4 engine upgrades, including the zero-tail-swing CX17B, CX27B, CX31B, CX36B and CX50B compacts. The 8.3-metric-ton CX80 is similar in size class to the minimum-swing-radius CX75, but boasts one major difference in features. With the center-swing boom, the CX80 can be positioned right along a foundation or dig directly next to buildings. The versatile swing boom can be positioned anywhere within a 130-degree arc. For its part, the CX75 has an offset-boom option. Case has increased hydraulic horsepower on all models to better handle the range of attachments being used by the compact carriers today. Product-line features: Case continues to stress easy maintenance across all product lines, and these machines are no exception featuring swing-out access panels that supply full access to coolers and hydraulic valves. Ground-line daily maintenance checks require no tools, increasing the likelihood the necessary duties will be completed. As part of an 11-model compact excavator line topped by the 7.5-metric-ton 442 model, Bobcat recently introduced a replacement for the smallest member of the family. With a dig depth of 6 feet, the 1-metric-ton 418 replaces the 316 and, designed to work in the tightest of areas, was developed to take on a zero-tail-swing configuration when the tracks are extended. Bobcat offers a range of conventional, zero-tail-swing and zero-house-swing models. The two zero-house-swing machines, the 430 and 435, are also available with a hydrostatic FastTrack drive system. Product-line features: Bobcat now offers an angle blade option on the 335, 337, 430 and 435 compact excavators. This allows operators to hydraulically angle the blade plus or minus 25 degrees, creating a four-way blade with up, down, right angle and left angle movement. In 2008 Gehl introduced the 283Z compact excavator that, with a transport weight of 2.7 metric tons, can be moved on some passenger vehicle trailers. With a superstructure that rotates entirely within the tracks without overhang, as reflected in the Z model designation, the newest Gehl excavator comes standard with two-way auxiliary hydraulics featuring a direct-to-tank return line to seamlessly power attachments. 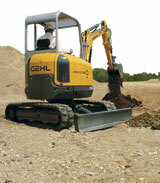 Also new this year, all Gehl compact excavators are available with factory-installed thumbs. All models except the 603 and 753Z have been updated with Tier 3 engines. Product-line features: Gehl compact excavators feature (as standard) hydraulically dampened drive levers and pedals to ensure precise handling, as well as independent boom swing, rubber tracks and dozer blades. Models 223 and 373 have a house leveling feature that enables the digging of vertical trenches on hillsides without benching or filling. The 6.2-metric-ton 60D is a new model size for John Deere that represents the largest of what the company classifies as its compact excavators. It stands 8 feet 5 inches in height and 6 feet 7 inches in width, with a tail-swing overhang of 12 inches when rotated 90 degrees. Yet, the 60D boasts many features found on Deere's larger excavators, including auto idle, auto speed shifting and multiple engine working modes. The addition this year of the 8.5-metric-ton 85D gives Deere a size and configuration option between the conventional-boom 75D and the 120D. Product-line features: The family's smallest model, the 17D introduced in 2007, features adjustable-width tracks with a foldable-end backfill blade, facilitating the ability to travel through a 40-inch opening. As Komatsu continues to update its compact-excavator offering, the focus has been on the development of MR or minimum-swing-radius machines. For Conexpo-Con/Agg 2008, the PC35MR-3 and PC45MR-3 debuted with features found on most if not all of the other MR-3 Series compact machines, including the web-based wireless Komtrax fleet management system, a standard thumb mounting bracket, standard auxiliary hydraulics and an integrated counterweight. The 8.8-metric-ton PC88MR-8 incorporates features of the updated Dash-8 medium and large Komatsu excavators, including five working modes and the fully featured Construction Equipment version of Komtrax. Product-line features: An optional power angle blade allows operators of the MR-3 compact excavators to angle the blade 25 degrees to the right or left, which is particularly useful when backfilling trenches. Wide entrances and strategically placed handholds provide easy access to the tilt-forward operator stations. With the Conexpo-Con/Agg 2008 announcement of the new EC35C and ECR48C, Volvo's C-Series transformation of its 10-model-size compact excavator line was underway. The line is comprised of five conventional and five short-radius model sizes, the latter group designated ECR and topping out with the 8.5-metric-ton ECR88. The EC35C and ECR48C both use the Volvo D2.2D diesel en-gine rated at 36 horsepower. The 3.5-metric-ton EC35C digs to 11 feet 10 inches from its conventional upper structure, while the 4.8-metric-ton ECR48C can dig more than 13 feet deep. Simultaneous control of swing and the boom offset enables faster, precise performance. Product-line features: The joystick is equipped with an electronically proportional roller, allowing the operator to adjust hydraulic flow to the attachments as needed. A Volvo-patented mono-pump hydraulic system efficiently uses one system for all hydraulics. Repowered to meet Tier-4 emissions requirements, the New Holland line of compact excavators also boasts increased bucket breakout forces, proportional controls for fine leveling and grading and, on several units, the availability of longer arms for greater reach and dig depth. The 3,600-pound E18B offers hydraulically controlled variable track width, ranging from 39 to 52 inches, the latter size at which the machine takes on the zero-tail-swing configuration of the E27B through E50B compact models. The “mid-sized” E70B zero-tail-swing and E80B short-radius models offer dig depths into the 15-foot range. Product-line features: The integrated sound and dust-reduction system of the E70B and E80B cuts operating noise by 5 dB(A), making these “mid-sized” excavators as quiet as smaller units. As a member of the ViO product family, Yanmar's new 1.7-metric-ton mini is a true zero-tail-swing excavator designed to allow for 360-degree turning of the counterweight within the width of the crawler. The ViO17's tracks are adjustable down from 49 to 37 inches for cramped-site access, and the short-pitch, rubber-track tread blocks offer enhanced driver comfort in travel mode. 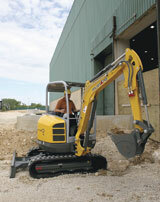 The mini-excavator has a maximum digging force of 3,417 pounds while providing a digging depth of 7 feet 7 inches. Product-line features: Offering models up to 20,730 pounds in operating weight, Yanmar's “compact” range is split into three families. Two SV machines offer ultra-tight turning, topped by the SV100 model, while the 8-metric-ton B7-5A uses a “Sigma” offset boom for zero tail and front swing overhang. To enhance operator comfort, speed and efficiency, Kubota located the two-speed travel switch on the dozer lever of the new U15, U25 and U45 zero-tail-swing compact excavators, complemented by adjustable wrist rests to help reduce arm movement. While each of Kubota's four U-Series excavators has a 360-degree turning radius, the new models boast differentiating features beyond their sizes: The 1.5-metric-ton U15 features a hydraulically adjustable track gauge; the U25 boasts a swivel negative brake and intelligent control system; and the likewise-intelligent U45 has a load-sensing hydraulic system, auto idling system and angle blade with float. Product-line features: Judged one of Construction Equipment's Top 100 products in 2007, the tight-tail-swing KX080-3 model moved Kubota beyond its traditional “mini-excavator” offering. The 64-horsepower, 8-metric-ton package tops the company's KX Series of excavators. 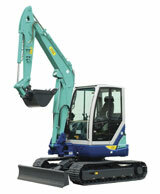 At just a shade over 6 metric tons, the new ZX60USB-3 is the largest of what Hitachi considers compact excavators. It, along with the 8.5-metric-ton ZX85USB-3, is a new size offering within the Hitachi lineup that features swing boom for digging parallel to walls and foundations. The ZX60USB-3 has many features found on Hitachi's larger excavators, such as a choice of standard and economy engine modes, automatic shifting between high and low speed propel, and auto idle for the saving of fuel. Product-line features: As with the ZX85USB-3, the reduced-tail-swing ZX75US-3 at about 8 metric tons carries over features found in other Dash-3 machines, such as regenerative flow on the boom, stick and bucket cylinders for faster down movements, extremely fine control and multi-tasking. While introducing new 3.5-metric-ton TB235 and 5.0-metric-ton TB250 models, Takeuchi has also incorporated a number of enhancements to its compact excavator product line. A side-by-side radiator/hydraulic oil cooler combo offers a much greater cooling capacity — 38-percent on the TB235, according to the company — and a new larger operator's compartment has 12-percent more interior volume and 15-percent more foot room. New interim Tier-4 engines power the excavators, which come with a control pattern selector valve as standard. Product-line features: A four-pump hydraulic system allows the Takeuchi excavator to handle multiple functions with ease, resulting in faster cycle times and increased production. Cushioned hydraulic cylinders operating the boom, arm and swing reduce jarring. With the introduction this year of the 2.7-metric-ton, trailer-compatible 2803ZT, Mustang has added a fourth zero-tail-swing model to its compact excavator family. While eliminating rear overhang is the main ambition of the zero-tail-swing design, the 2803ZT “goes a step farther” by enhancing stability with a longer undercarriage, says Mustang. For added stability, the slim machine offers a sturdy track width and optional counterweight, in addition to a large cab. A side-mounted engine and rear-mounted hydraulic and fuel tanks provide easy maintenance access. Product-line features: All Mustang compact excavators feature an advanced hydraulic system designed to allow simultaneous, multiple-hydraulic functions without loss of power or speed. Use of a double variable-displacement pump and self-balancing power regulation provide increased operating speed and power. The newest addition to the Terex zero-tail-swing excavator lineup, the 5-metric-ton TC50 benefits from Terex's use of axial-piston, variable-displacement pumps and motors in a load-sensing and load-independent flow division hydraulic system. Oil flow is distributed to the cylinders independent of the load, allowing multiple actions at one time. An offset boom design with built-in swing allows multi-width excavation, parallel-to-wall operation, and clear visibility for the operator. Top-mounted, inverted boom cylinders help prevent dirt build-up on the cylinder seals and hoses. Product-line features: The use of spherical bearings, longer-wear main pin connecting points, and perforated tin/bronze bushings reduces maintenance costs and increases uptime, says Terex. Each compact excavator is built with a large operator's platform featuring two-sided entry. With an operating weight of 10,206 pounds, the new zero-tail-swing 40VXL is the latest addition to the 13-model IHI compact excavator lineup. Powered by a 38.5-horsepower Yanmar engine, the 40VXL offers a digging depth of 11 feet 10 inches and digging force of 9,854 pounds. Standard equipment includes a four-post canopy, auxiliary hydraulic piping, pattern change valve, suspension seat, backfill blade and rubber tracks. The 40VXL's introduction in the fall of 2008 follows the 11,700-pound, zero-tail-swing 55NX debuted last year. Product-line features: According to IHI/Compact Excavators Sales, all models in the full IHI line of conventional and zero-tail-swing machines comply with Tier-4 engine requirements. In the formal definition of mini excavators, those up to 6 metric tons, the Link-Belt product line would not be considered a player in the market. But when the definition of compacts is extended, a couple of LBX's Spin Ace models fit the bill. At 17,461 and 18,585 pounds, respectively, the newly updated 75 Mono Boom Tier 3 and 80 Swing Boom Tier 3 minimum-swing excavators are powered by re-engineered Isuzu engines boosted to 54 horsepower. Both the 75SA and 80SA models come standard with a blade attachment. Product-line features: A choice of arm lengths — 5 feet 7 inches or 6 feet 11 inches — is available for both the 75SA and 80SA models. A wide, low-noise cab design features a large entry door and expanded leg room “floating” on silicon-filled isolation mounts. 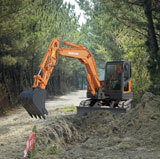 Typical of the company's medium- and heavy-duty excavators, Doosan's zero-tail-swing DX compact excavators boast spacious operating areas with ergonomically de-signed working controls that ensure convenience and comfort for the person at the controls. 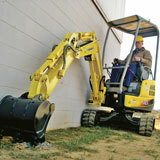 Ac-cording to the company, DX compact excavators offer a host of features, including an electronics package for optimum performance and fuel economy; dual-walled exhaust silencers to reduce noise; convenient hose routing, wiring harness layout and filter placement; and centralized grease points on the boom and arm. Product-line features: A wheeled version of the DX55 model is additionally available as part of the Doosan compact equipment offering. At Conexpo-Con/Agg 2008, JCB introduced the reduced-tail-swing 8055 RTS model as a replacement for the 8052 in the 5- to 6-metric-ton excavator range. Beyond the tail swing of just over 2 inches, a new feature is electronic throttle control, which facilitates an auto idle kick-down for improved fuel efficiency. As on the 8080-style machine at the top of the JCB product range, the 8055 has fold-up tracking pedals as standard. As with the smaller 8045, the cab/canopy is isolated from the slew frame to reduce noise and vibration levels for the operator. This is enhanced with the use of an isolated seat base. Product-line features: The JCB compact excavator lineup offers conventional and zero-tail-swing models ranging from slightly less than 1 metric ton to 8 metric tons in operating weight and from 5 feet 6 inches to 13 feet 10 inches in digging depth. The top-of-the-line 8080 features an advanced management system, as found on many of JCB's full-sized JS and JZ Series excavators.